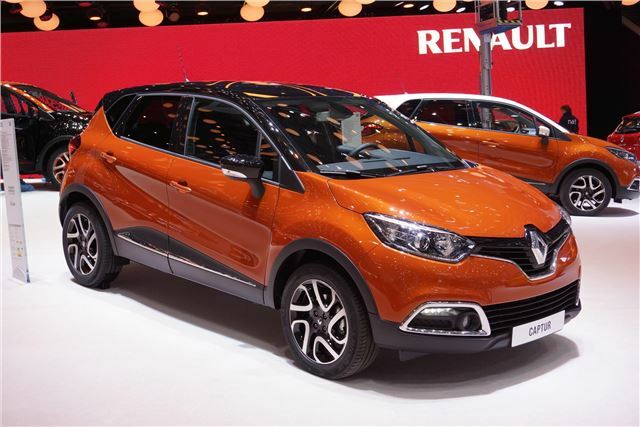 The new Renault Captur a Clio-based crossover, has been unveiled at Geneva. It's a rival for the likes of the Nissan Juke, as well as the new Ford Ecosport and Peugeot 2008, and it will go on sale in the autumn with prices expected to start at around £12,500. The new Captur, is based on the same platform as the Nissan Juke. It's vitally important too - in the UK, Renault sales in 2012 were down 40 per cent from 2011, as the range and dealer network were slashed in half. But Renault hopes that the new car, which is a stylish addition to a growing market, will help to turn things around. The timing of the Captur's reveal is no coicidence - its maker has ambitious targets for the Captur, and hopes that it can outsell the Peugeot 2008. The 4120mm length means it's compact enough to make a good city car. With such an emphasis on style, Renault is hoping to attract chic young urbanites, while cashing in on the success of other small crossovers. Customisation will be a big part of the Captur buying experience. The engines are shared with the Renault Clio (and Dacia Sandero), and the range includes the 90PS 900cc turbocharged three-cylinder petrol and the 1.5-litre dCi. CO2 output starts at 96g/km but no fuel consumption figures have been released yet. Expect the Captur to go on sale in the UK in the autumn of 2013.